Street Outlaws No Prep Kings - Palm Beach Int. $40 ticket price is for presale only. Price at gate on day of event is $50 DUE TO THE SIZE OF THE VENUE AND LIMITED SEATING, THIS IS A SPECIAL ENGAGEMENT/ MORE INTIMATE EVENT. TICKETS MAY NOT BE AVAILABLE AT THE VENUE DAY OF EVENT. Best Seats VIP -This is a VIP premium seating section closest to the starting line, only accessible to Best Seats VIP ticket holders. Limited Quantities. Online/Presale price is $49. Price at gate on day of event is $60 (if available). Be sure to also purchase a VIP ticket for your child so he/she has a spot. Tickets available for children below for $5. DUE TO THE SIZE OF THE VENUE AND LIMITED SEATING, THIS IS A SPECIAL ENGAGEMENT/ MORE INTIMATE EVENT. TICKETS MAY NOT BE AVAILABLE AT THE VENUE DAY OF EVENT. Best Seats VIP -This is a VIP premium seating section closest to the starting line, only accessible to Best Seats VIP ticket holders. Limited Quantities. Online/Presale price is $69. Price at gate on day of event is $80 (if available). Be sure to also purchase a VIP ticket for your child so he/she has a spot. Tickets available for children below for $5. DUE TO THE SIZE OF THE VENUE AND LIMITED SEATING, THIS IS A SPECIAL ENGAGEMENT/ MORE INTIMATE EVENT. TICKETS MAY NOT BE AVAILABLE AT THE VENUE DAY OF EVENT. Get Me To The Line VIP - Starting Line Access. This is a exclusive section that gets you up close to the starting line where the Street Outlaws line up to race as well as meet for the Driver's meeting. This section gets the most fan interaction with the Street Outlaws cast. This ticket includes general admission into the venue. Limited Quantities. Children are not allowed at the Starting line. Online/Presale price is $69. Price at gate on day of event is $80 (if available). DUE TO THE SIZE OF THE VENUE AND LIMITED SEATING, THIS IS A SPECIAL ENGAGEMENT/ MORE INTIMATE EVENT. TICKETS MAY NOT BE AVAILABLE AT THE VENUE DAY OF EVENT. Get Me To The Line VIP - Starting Line Access. This is a exclusive section that gets you up close to the starting line where the Street Outlaws line up to race as well as meet for the Driver's meeting. This section gets the most fan interaction with the Street Outlaws cast. This ticket includes general admission into the venue. Limited Quantities. Children are not allowed at the Starting line. Online/Presale price is $99. Price at gate on day of event is $120 (if available). DUE TO THE SIZE OF THE VENUE AND LIMITED SEATING, THIS IS A SPECIAL ENGAGEMENT/ MORE INTIMATE EVENT. TICKETS MAY NOT BE AVAILABLE AT THE VENUE DAY OF EVENT. Details: This is for the Street Outlaws Mega fan. This ticket allows exclusive entry into the venue and the Street Outlaws cast pits one hour before all other ticket holders. This ticket also gives you access to the Best Seats seating section (this is the premium seating closest to the starting line) as well as access to the Starting Line (where the cars line up and race and where the Cast hangs out). Also, right before the first round of racing, you'll be called down and given access to the Street Outlaws cast staging lanes as they line up to race (The staging lanes are closed to the public). Online/Presale price is $99. Price at gate on day of event is $120 (if available). Be sure to also purchase a VIP ticket for your child so he/she has a spot. Tickets available for children below for $5. Children are allowed in the Best Seats section and The Staging lanes but are not allowed at the Starting line. DUE TO THE SIZE OF THE VENUE AND LIMITED SEATING, THIS IS A SPECIAL ENGAGEMENT/ MORE INTIMATE EVENT. TICKETS MAY NOT BE AVAILABLE AT THE VENUE DAY OF EVENT. Details: This is for the Street Outlaws Mega fan. This ticket allows exclusive entry into the venue and the Street Outlaws cast pits one hour before all other ticket holders. This ticket also gives you access to the Best Seats seating section (this is the premium seating closest to the starting line) as well as access to the Starting Line (where the cars line up and race and where the Cast hangs out). Also, right before the first round of racing, you'll be called down and given a access to the Street Outlaws cast staging lanes as they line up to race (The staging lanes are closed to the public). Online/Presale price is $149. Price at gate on day of event is $170 (if available). Be sure to also purchase a VIP ticket for your child so he/she has a spot. Tickets available for children below for $5. Children are allowed in the Best Seats section and access to The Staging lanes but are not allowed at the Starting line. DUE TO THE SIZE OF THE VENUE AND LIMITED SEATING, THIS IS A SPECIAL ENGAGEMENT/ MORE INTIMATE EVENT. TICKETS MAY NOT BE AVAILABLE AT THE VENUE DAY OF EVENT. FYI - Children are allowed in the Best Seats section and The Staging lanes but are not allowed at the Starting line. DUE TO THE SIZE OF THE VENUE AND LIMITED SEATING, THIS IS A SPECIAL ENGAGEMENT/ MORE INTIMATE EVENT. TICKETS MAY NOT BE AVAILABLE AT THE VENUE DAY OF EVENT. RV/Motorhome - With Electrical Hookups for the weekend. RV - NO Hookups. Price is for weekend. 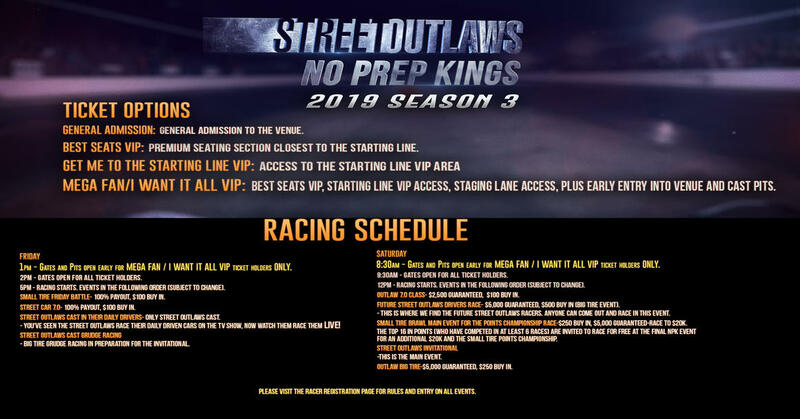 Street Outlaws No Prep Kings Event #8 at Palm Beach International in Palm Beach, FL DUE TO THE SIZE OF THE VENUE AND LIMITED SEATING, THIS IS A SPECIAL ENGAGEMENT/ MORE INTIMATE EVENT. TICKETS MAY NOT BE AVAILABLE AT THE VENUE DAY OF EVENT.